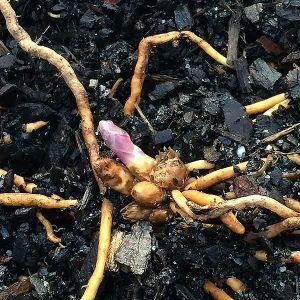 Asparagus plants are best grown from crowns purchased from a reputable supplier. Varieties such as Mary Washington can be grown successfully in the home garden. They are a plant that is usually grown in a permanent position. A typical number of crowns for the average family will be around 12. Asparagus are grown for the long spear tips. The spears will appear continuously through the season and should be picked before the tips begin to “fern out”. Given the right conditions an Asparagus spear can grow 3 cm in an hour…. so you need to pick asparagus every day. Once the asparagus ‘ferns’ it’s of no use for eating. The crowns will get larger and spread over time, so production will increase. If you prepare the soil well, an asparagus patch can be productive for 15 – 20 years, even longer with extra care. Plants will grow to over 1m and do require a sunny position and a deep loamy soil to do well. Asparagus can also be grown by planting 1-2 crowns in a large pot or container if desired. How to plant and grow Asparagus Crowns. Asparagus crowns are available for sale online to be planted during late winter to early spring. A humus rich well drained soil is required, this is a plant that grows best in cooler climates and needs a deep open textured soil, sandy loam is good. Asparagus are grown from crowns and as such one of the major care factors is to keep the area around them weed free, they do not like competition. Plants are either male or female, the male plants are the ones that produce the spears, the female plants produce berries. Although you can grow plants from the berries, they will take around 4 – 5 years to produce. Although you can grow asparagus from seed, it is usually grown from crowns. The crowns are available for sale in winter ready for planting. Crowns are spaced at around 50 cm apart and are often planted in staggered rows. Before planting, soak the crowns in a diluted seaweed fertiliser solution for 1 hour, this will give them a good start. You will need a good deep fertile soil, preferably in part shade in all but the coldest areas of Australia. You need to turn over and cultivate the soil to around 30 cms deep. Dig in lots of well rotted compost and some aged cow manure. Avoid fertilisers at this stage. The individual crowns need to be planted at around 20 cms deep. Cover with 4 cms of soil and water in. As the shoots appear, backfill with extra soil always leaving around 7cm of shoot exposed. Mulch over the top of the plants with a 15 cm layer of mulch. You should not harvest the spears of first year plants. In the second year, try not to be too greedy, and only harvest a few spears from each plant. You will need renew the mulch. After the second year, you are in full production, harvest as much as you want. Regular applications of fertiliser and mulch will keep a crown growing productively for 15 to 20 years. Asparagus crowns are best left for the first year without being harvested, or with minimal harvesting. After the second year crowns can be harvested for a period of 10 – 12 weeks, then leave to ‘fern out’, this allows the crowns to restore energy for the next season. Harvesting should stop at the end of spring to early summer. The most common is the green variety. Simply the spears turn green in the sun. The purple variety is different, regarded as sweeter in taste and with less fibre. White asparagus, simply asparagus that is grown in the dark, no sun for photosynthesis. Remember that asparagus are hungry plants and will appreciate a good top up with compost, well rotted manure and a little blood and bone after they have died back.